Why is Colón a reference in Barcelona? Everybody knows the history about Cristopher Columbus, Cristóbal Colón in Spanish, who sailed across Atlantic Ocean and discovered the New World. After convincing Catholic Kings, Fernando and Isabel, to support his project, Colón started his trip in August 1492 with three boats named Pinta, Niña and Santa María. After more than two months sailing, Colón and his crew finally arrived in land. They disembarked in Bahamas and they realized they weren’t in India, which was its real destination, but they had discovered a totally new Continent. After his discovery, Colón returned to Spain to meet with Catholic Kings, who were in Barcelona. That is why Colón sailed to Barcelona, where history still reminds the huge convoy he brought with him: new food, new clothes, totally different people, distinct cultures… Everybody was amazed with all the new discoveries Colón made. Taking all this into account, it seems logical the presence of a monument to Colón in Barcelona. In fact, he is one of the most important figures in Catalan history together with Jaume I. At the lower part of one of the most famous streets in Barcelona, Las Ramblas, we find Colón Monument. 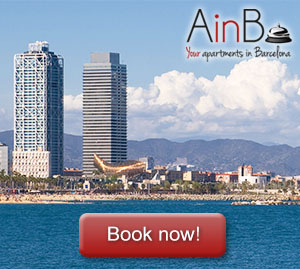 This is a beautiful part of Barcelona, so apartments in Colón are one of the best options to stay because they are near the city center, the beaches and really beautiful and different neighborhoods. The monument is a huge column with more than 60 meters of height. On the top of the monument, there is a 7 meters tall statue representing Cristóbal Colón. The base of the monument is full of different sculptures representing Spanish regions, important characters related to Colón and his trip (Catholic Kings, Pinzón brothers, Luis de Santángel, and so on), different moments of his life, eight lions, and mythologic characters related to success and glory. On the top of the column, the statue represents Colón with typical clothing of those times. On his left hand, he is holding a navigation chart, while he is pointing to the see with his right hand. One curious issue about Colón Monument is the direction where his finger is pointing to. Since he is pointing to the sea, it was thought that Colón statue was pointing to America, the New World he discovered. But thanks to the study of coordinates, it was proved that he is really pointing to the island of Majorca. Another theory said that the figure points to Genoa, city where Colón was supposedly born. The most accepted reason nowadays explains that this was just a design decision. They designed this sculpture pointing to the sea in a metaphoric way. If they would have built the monument pointing to the exact coordinates of America, Colón would be pointing to land, so it could cause some confusion. That is the reason why Colón is pointing to the sea, reminding his trip and discovery. The sculpture of Colón has another curious issue related with the finger he is using to point to the sea. This finger has a length of 50 cm, meaning this a disproportion according to architectural designs. But don’t worry! It isn’t a design mistake! In fact, it was built like this totally on purpose. This way, people can clearly see the finger from land. Not many people know about it, but Colón Monument has an elevator inside the column to go up to a viewpoint. From there, you can enjoy of breathtaking views of Barcelona: Mediterranean Sea, Montjuïc hills, all the churchs and the Cathedral in Gothic Neighborhood… it is an unforgettable landscape!